A few years ago my paternal aunt gave me the Family Bible that had been owned by John Edward Roberts and his wife, America Burns Roberts, my great-grandparents. 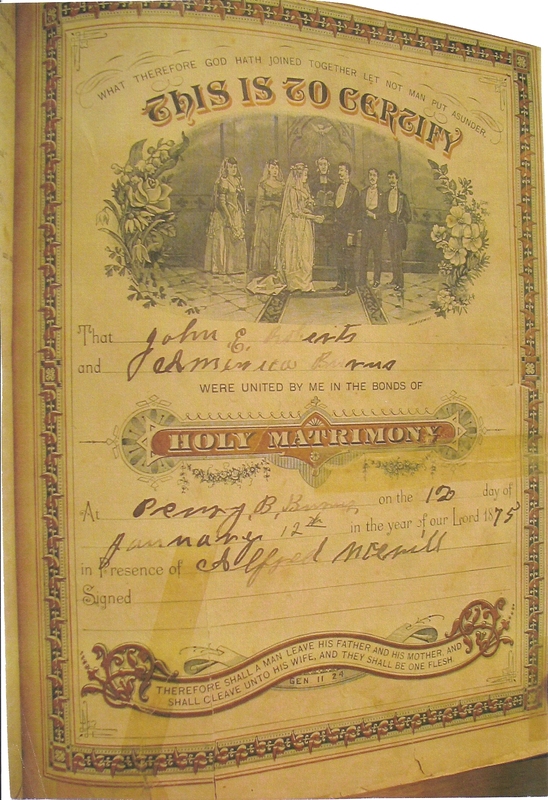 John and America were married on January 12, 1875. My paternal grandmother, Florida Roberts Burns, was the 12th of their 13 children. In the spring of 1879, the young couple and their 2 sons, along with John’s brother, Andrew Mack, and his wife and 3 children set off for a new start in the West. Fortunately for our family, John’s brother, Andrew Mack, wrote a memoir in 1932, which recounted their Western experience. We learned that their journey ended in the area of Eugene, Oregon and that both brothers were out of money. America, pregnant when their travels began, gave birth to a daughter. The brothers found farm work but were living in shacks. Prior to leaving Oregon to return to Kentucky in 1884, America gave birth to another daughter and a son. 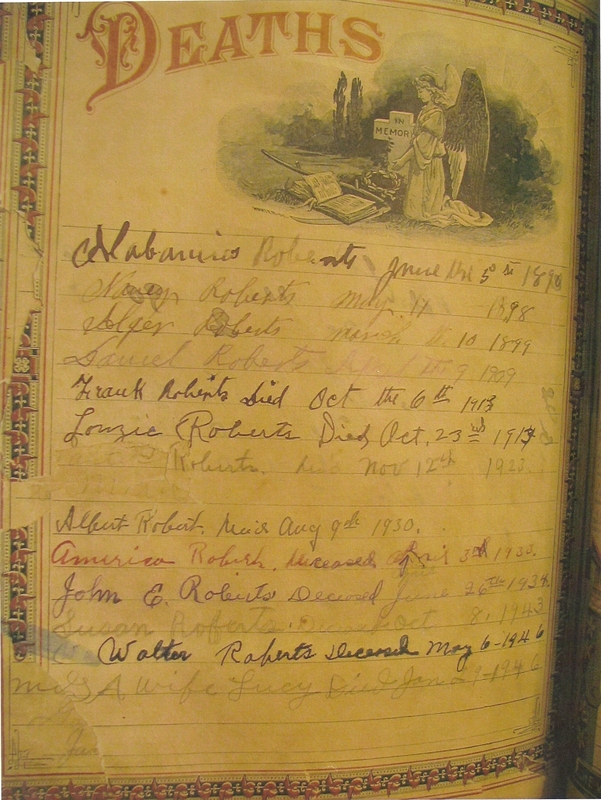 I was researching my Roberts family and I looked more thoroughly at the Bible records, written in John’s hand. I noted a son named Frank who was born on March 20, 1884. I realized that he was the son born in Oregon. 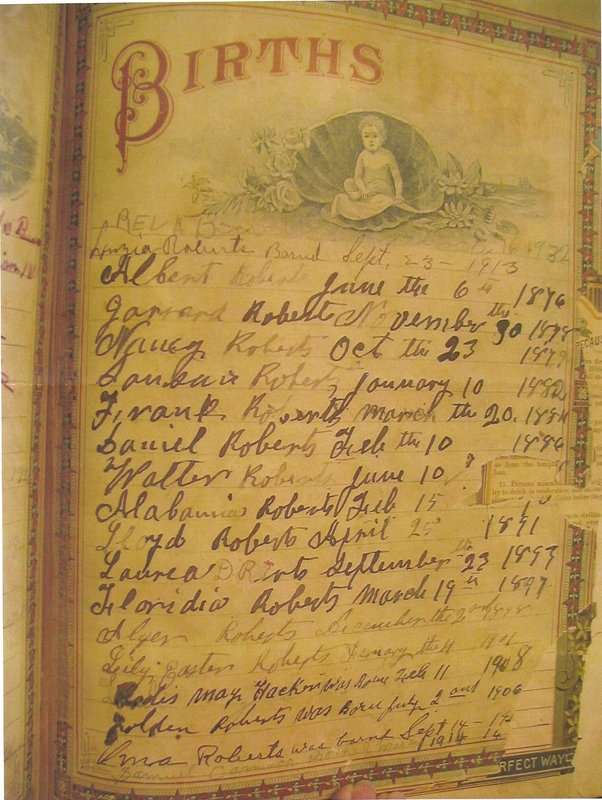 I looked at the death records and saw that Frank died on October 6, 1913. I was quite puzzled. My grandmother would have been 16 years old at the time of Frank’s death. I was quite close to her and I heard her speak often of her brothers and sisters. I had never heard her mention Frank, even though she should have had a clear memory of him. I asked those family members still living who might have known of Frank if they had any information about him. None of them had ever heard of Frank. I was determined to learn about Frank and to unravel the reasons why he was only a name in Bible records. First I examined a family picture from 1906 and verified that he was not in the picture with his parents and siblings. Why? I then went to the census record of 1900 and found Frank at home with the family as a farm laborer. However, in 1910 the census record offered a huge clue. 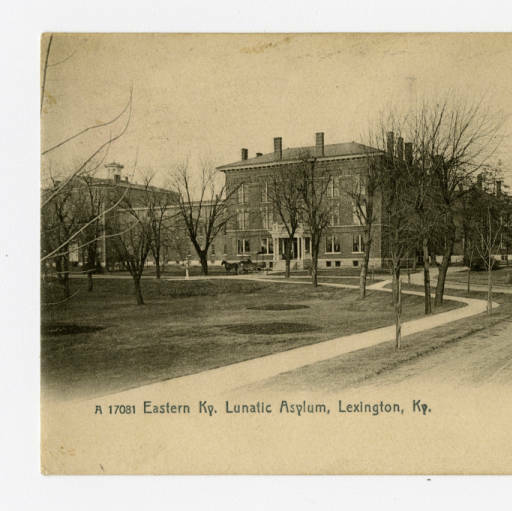 Frank was a patient in the Eastern Kentucky Lunatic Asylum at Lexington, Kentucky. I was able to find Frank’s death certificate and it stated that he died of TB at the Asylum at age 29. He was a patient there for 6 years, 1 month and 5 days. This information led to calculating his date of admission at about September 1, 1907. Lexington was a long trip from Oneida, Kentucky at the turn of the century. I think that it was quite likely that none of his family had ever visited him at the hospital due to the length and expense of travel. It is also possible that he was an embarrassment and that they had just forsaken him. It makes me sad to think that he died alone, with no one to hold his hand as he breathed his last breath. There was no one to witness his burial on the Asylum grounds or to drop a flower on his grave. Kentucky Historical Society, Ronald Morgan Kentucky Postcard Collection. I was curious as to the conditions at the asylum and was fortunate enough to find a book that was written on the basis of old records, called Kentucky’s First Asylum: A Saga of the People and Practices by Alma Wynelle Deese. A chapter in the book described the asylum during 1906, just a year before Frank’s admission. I learned that for many years nearly all positions, from the administrative to the most menial, were political appointments. The governor hired his friends, relatives and those to whom he owed favors. The caregivers had no training at all and were often illiterate. The administrators were constantly changing ,leading to a lack of stability at the institution. The patients were housed in wards according to their gender, with 50 patients per ward, overseen by 3 “keepers”, who worked in shifts. Thus there was 1 person on duty to care for 50 people. There were indoor plumbing and bathroom facilities. The beds consisted of wooden boxes covered with sawdust to absorb the results of toileting accidents and to reduce the odor. Any patient considered out of control would be tied to a chair. Patients consistently difficult were placed in separate wards, away from more docile patients. The care given to the patients was less than minimal, by modern standards. There was an infirmary for the sick, but there was not isolation for TB patients at that time. Any medical care was ineffective and treatment for mental illness was nearly non-existent. It was very rare that any of the patients were released back into society and most died at the asylum and were buried on the grounds. There was a passage in the book that described transport of mountain patients in 1923. Although this was 10 years after Frank’s death, the description sounds about right for someone in Frank’s circumstances. All of the patients were brought into Lexington by train. The aides would go to the patient’s home, often accompanied by the local sheriff, and would bring the patient to the train, where he would be put in the baggage car on a cot. The patient would often be very agitated and fight the aides. The whole scenario seems very inhumane but knowledge about mental illness was limited. It seems unbelievable that anyone, even in that day, would think that the asylum conditions were acceptable, but perhaps these people were truly the throwaways of society. So the secret has come to light. There are still questions which will go unanswered. Frank was at home in 1906 when the family picture was taken. Was he too out of control to be included? His father said that Frank was weak-minded. What did that mean…slow to learn and understand? The dates indicate that Frank was 23 when admitted to the asylum and that his outbursts had begun 18 months earlier. Were the outbursts the result of the sudden onset of mental illness? Were they the result of his frustrations at being weak-minded or slow to learn? Why was he so “mad” that he would set fires and behave violently toward others? Why did my grandmother never mention his name to me? Was she ashamed? Was she just following the customs of her girlhood? I truly believe that she would have told me about Frank if I had asked but I did not know to ask. 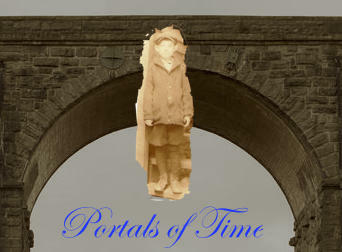 Some secrets are never fully revealed, lost in time. I am happy that Frank is no longer forgotten. I think upon him with sympathy and sorrow. He is family.